NHT SW2 Powered Subwoofer (installed Plate amp with xover). 10" NHT driver. - Grill is a custom made wood grill with NHT emblem. This is a rare powered version of the SW2 10" subwoofer. - Driver : One - 10" high-excursion, polypropylene woofer. Impedance: 6 ohms nominal. Sensitivity: 85dB (2.83V at 1M). Crossover Slopes: 12dB LP, 12dB HP. Just like the original. NHT SuperZero 2.1 Mini-Monitor Speaker. The SuperZero 2.1 is small speaker, at just 9" tall x 5" wide x 5.5" deep, that achieves its lifelike mid-range and high frequencies through acoustic suspension technology. NHT subwoofer With Converter and Controller And Power Cable. It’s in mint condition. NHT Super Zero 100 W Bookshelf Speakers. One owner 1993 pair of speakers that still KICK. I will also send the schematics / details of the Hidley crossover. New open box NHT XdS speaker pair. These XdS speakers are superbly finished, seriously stunning in the rare special dark / black finish. A dustcover on one of the speakers pushed back. I am the second owner of this pair of NHT SB-1 speakers. They are not Goodwill or flea market finds. If I could describe them with one word it would be "accurate". I've used them as main speakers, surround sound speakers, and even a center channel speaker. This is for a pair of NHT SB1 Speakers. It is in good working condition. The outside is scratched up from moving around a lot. You won’t see the scratches once it is on a bookshelf, mounted on the ceiling or standing about 2 feet away. Speaker fully tested and in working condition. Overall condition is great. Minimal scratches. Looks great! Sold as is. Speaker System Type. tweeter driver, woofer driver. Speaker System. Crossover Channel Qty. Speaker System Details. Speaker Type. Speaker Qty. Driver Details (1st speaker). 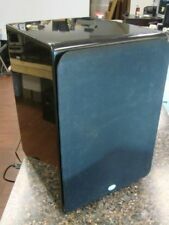 NHT 10 Powered Subwoofer 300W. In Excellent shape. Very well cared for and hardly used. Screen is a little dusty. International shipping charges apply. With a variety of mounting options, the C-1 can be placed on stands, shelves or wall mounted (with optional mount). NHT C Series C-1 2-Way Bookshelf Speaker (Single) - High Gloss Black. So at the very peak of the recession in 2008, I left my VP position and started WiredForLess. Speaker has been tested working onsite! Speaker is in fair condition and has heavy wear from previous use including blemishes, scuffs and scratches. One of the post on the grills is broke off . Includes speaker only. Unit is on hand and ready to ship. Please feel free to message us any question you may have. 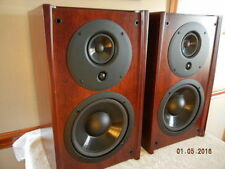 Thank you for checking out our listing. .
Model Absolute Wall Speaker Specifications. Recycling Inc. Order Processing. NHT Super One Bookshelf Speakers (Pair) - Piano Black. Condition is Used. Shipped with FedEx Ground or FedEx Home Delivery. One has a small ship in the finish on the back top corner. The cabinets have some light scuffs but look pretty good. These are ~ 7.25"x9.25"x12" They sound amazing. Both the woofers and tweeters work. Good condition bookshelf speakers. there are a few scratches but pictures should show the flaws. A stereo pair of beautiful NHT SuperOne speakers. I have only used them briefly in a bedroom stereo system. They are not even broken in. It has deeper bass than I was ever expecting. The SuperOne was originally designed for hi-fi stereo systems with or without a subwoofer (.1). Pics are 100% accurate. EXCELLENT CONDITION. Bass response down to 40Hz makes subwoofers optional. Improving on earlier NHT designs, the C-3 is sturdier and more serviceable. NHT C Series C-3 3-Way Bookshelf Speaker (Single) - High Gloss Black. Bookshelf speaker. High Gloss Black. Frequency Response. 13.75" x 7.5" x 10.125" (H x W x D). 50 - 150 w/ch. 6 ohms nominal, 4 ohms min. 1 x 25i Floor Standing only, the right side. All functions have been tested and are in working order. No accessories are included. The NHT Super One 2.1 has arrived. The original Super Zero and Super One established NHT as a force in the world of high-value, high-performance audio. Phone Cases. Brian Carlsness. Happy Listening! Any accessories, cables, or parts, if included, will be shown. This is a very nice pair of NHT Super Zero speakers that I used for rear surround sound. I have not used them much and they are in excellent working condition. They are white,(not glossy). They sound great. 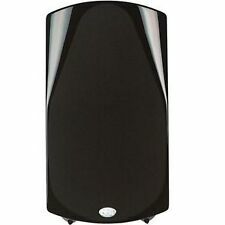 Now Hear This NHT Super One Speakers (2). Speakers all work good and sound Great. In-room Response: 57Hz-25KHz /-3dB. Very minty condition! You won't find the white color edition in the entire internet tapestry. Model SW1S Subwoofer. It has been TESTED and has fantastic sound. We combined both our previous 2C and 3C centers into a single product and redesigned the cabinet so it can be used vertically as well as horizontally to create a powerful front end of a high output theater system where space is limited. NHT 1.3 Speaker Systems 30-150W. Condition is Used. Shipped with USPS Retail Ground. What you see is what you get. Please see all photos. SuperZero Xu. NHT Performance Series. Speaker System Type. SPEAKER SYSTEM. Connectivity Technology. mid/woofer driver, tweeter driver. Great little monitor. All are in excellent condition, no tears in the fabric baffle or scratches in the cases. Set of 2 Speakers. All the Speakers work great and sound Great. All push pins are intact for the grills one little snag on lower part of one grill. With a slim profile design, easily mount this center channel speaker mount flush against the wall either above or below a TV (with the optional bracket) or place on a tabletop or shelf. Manufacturer: NHT Audio. This is one nice superOne speaker by NHT in good working order. One of 4 pegs missing from grill insertion but grill stays on well with only three;. 1 pair NHT SB2 Serial No. 011590 and 011591. Superficial scratches on top of both speakers but does not affect functionality. Wall mountable - screw hole in back. 1 plastic tab on grill has broken off. NHT 2.9 speakers (black with original boxes). Excellent condition NHT 2.9 four-way, floorstanding, acoustic-suspension loudspeakers. Grills are also excellent. I've been using the bigger NHT 3.3's which I also own, so these 2.9's were used less frequently in a second room. This subwoofer is tested and sounds great. It is missing the grill. Has a few marks on the surface but overall good condition. Speakers are used and in very nice overall condition, they have been tested and sound great, see pictures for better details on condition. NHT provides a wide selection of speakers for use with compatible digital electronics. These sets are suitable for many spaces, home projects, and entertainment needs that can be connected to a central console. The NHT brand offers a powerful distribution of bass, mid, and high output ranges through a selection of speakers you can uncover today on eBay. What are NHT systems used for? Home stereos - Home entertainment comes in many forms, and the bulk of each form can be integrated with a speaker set. Home theaters and music stations need a speaker for their audio play. Speakers are portable, Bluetooth-enabled, and are provided with cable extensions to ensure power wherever the speaker sits. Surround sound - Enhancement is a consideration to make as you find the perfect way to adjust your new or used NHT home theater speakers. Workstations - Your office and workstation may require speakers for communications and for getting the news you need with clarity. 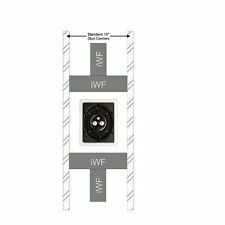 Do all NHT speakers need outlet power? Using outlet power is essential to maximizing the performance of these sets. Heres an intricate package that uses up to 100 watts of power for performance. You get to decide on how that power is used and how it combines with other assembly parts. The signal the speakers reproduce is only possible once the audio signal is converted into electric. This set has been so efficient as to take that electrical current and reproduce it through various diaphragms that alter tone, sound, and volume. The power-source you need is as simple as a 12-V outlet. You can connect directly to your wall-power, or consider using the power already cycling within an input source. Those options include mixers and direct connection to digital electronics. What is the importance of watts for speakers? Watts are important to understand when you need to gauge how much volume and overall power a speaker has. Every sound system is used for a specific reason, and the system you build can match your needs. NHT Speakers use a base of 25 to 200 watts. Content provided for informational purposes only. eBay is not affiliated with or endorsed by NHT.